Iowa is an agricultural state in the upper Mississippi Valley. It is located in the Midwestern region of the United States of America. It is bordered by Minnesota to the north, Wisconsin and Illinois to the east, Nebraska and South Dakota to the west, and Missouri to the south. It has an area of 56,272 square miles (145,743 km²) and in 2008 had an estimated population of 3,002,555. The capital and largest city is Des Moines. 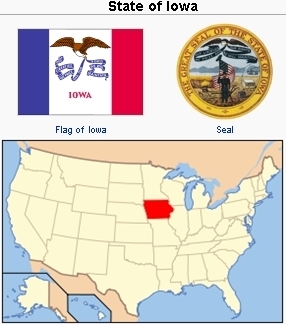 Iowa was the 29th state of the United States, having joined the Union on 28 December 1846. In 2005 the population of Iowa was 95.79% Caucasian and 2.79% African American. In 2001 the religious affiliation of the state's population was as follows: Roman Catholic - 23%; Lutheran - 16%; Methodist - 13%; No Religion - 13%; Baptist - 5%; Other Christian - 5%; Presbyterian - 3%; Congregational/UCC - 2%; Other Protestant - 2%; Pentecostal - 2%; Assemblies of God - 1%; Church of Christ - 1%; Non-Denominational - 1%; Other Evangelical - 1%; Other - 6%; Refused to Answer - 5%. In 1953 Iowa had nine Mennonite communities with approximately 5,200 members. Of these, 2,814 were members of the Mennonite Church (MC), while 817 are Old Order Amish, 754 General Conference Mennonites, 470 Conservative Amish Mennonites, 230 United Missionary Church, 52 Beachy Amish, and 26 Evangelical Mennonite Brethren. By 1839 the wave of Mennonite westward migration had reached Iowa, when John C. Krehbiel from the Palatinate settled in West Point Township, Lee County. By 1845 enough settlers had located there to make it possible to organize a church (General Conference Mennonite), but this was postponed until 1849 because of the murder of their minister. In 1850 they completed the building of their new church, the first Mennonite meetinghouse in Iowa. Later a new one was built in West Point, but by the 1920s or 1930s no services had been held in it, and the West Point congregation has been dissolved. During the 1850's large numbers of Mennonites from the Palatinate and from Bavaria moved into Franklin Township, and organized the Zion congregation, which is now located in Donnellson. As their numbers increased, a third congregation was organized in Franklin Center, but when their members moved to Kansas in the seventies their church declined in membership, and the building was finally torn down. Only one congregation of Mennonites is left in Lee County, but through the influence of their German parochial school, which they maintained until World War I, they have preserved much of their German background and their philosophy. Members of the Lee County church moved to Washington County, where they organized the Salem Church in 1865, but after 1875 the members began to move to Kansas and the church became extinct. The Christian Raber family, who reputedly settled in Lee County in 1840, were very likely the first Amish to live in Iowa. The Rabers were followed by other Ohio families, so that by 1846, when Bishop Joseph Goldsmith arrived from Butler County, Ohio, there were enough Amish for the organization of a church. By 1855 the church membership reached 55, its largest number. At that time, the Amish began to move to Henry and Davis counties, and in 20 years their Lee County settlement had completely disappeared. The first Amish to settle in Davis County bought land there in 1854, but did not organize a church until 1861. At that time they had 32 members and in 1954 they had 121. By 1890, when the Pulaski Mennonite Church joined the Middle District Mennonite Conference (GCM), they had discarded all of the distinctive teachings of the Amish branch. The settling of Joseph Roth in Jefferson County in 1843 was the beginning of the Jefferson-Henry-Washington County Amish community. During the next decade Amish settlers moved into Henry County, and in 1851 they first bought land in Marion Township, Washington County. These settlers, originally from Alsace and Switzerland, had migrated from Wayne County, Ohio. Their church (Mennonite Church) was organized in 1852-1853 by Joseph Goldsmith of Lee County. After he moved to Henry County in 1855, he became its resident bishop. At first there was only one church organization, but later the church was divided into the Trenton Township and the Marion Township congregations, with Goldsmith in charge of both. In 1862 Benjamin Eicher was ordained preacher of the Washington County group and in 1866 he became bishop. The two congregations gradually drew apart, and after 1874 the Washington County or "Eicher" church no longer co-operated with the Henry County congregation, which came to be known as the Sugar Creek Church. The Eicher church developed along more liberal lines than its sister church, and in 1892 it joined the General Conference Mennonites (GCM). In 1900 the Eicher congregation established a branch church in Wayland, which since 1927 has been an independent congregation. The Sugar Creek Mennonite Church (MC) outgrew its building and so in 1949 the Bethel church was built north of Wayland to accommodate the members living in that area. The combined membership of the two churches in 1955 was over 600. Settlements established in several other Iowa counties were not permanent. Among these were the Mennonite settlement established in Mahaska County in 1852 (MC), the Page County Mennonite colony of 1864 (MC), and the Polk County group of 1856 (GCM). The Amish Mennonite settlements established in Pocahontas and Wright counties during the 1890s have also disappeared, and the church established by the Stauffer Mennonites from Pennsylvania in Osceola County lasted only from 1887 to 1911. These groups were so small that it was difficult to maintain a community life. Other causes for their failure were the lack of leadership and disagreements among the ministers. The Shambaugh, Iowa, Mennonite Brethren in Christ Church was organized first as a Brethren in Christ congregation, but joined the Mennonite Brethren in Christ conference after 1883. Near by was the New Market Mennonite Brethren in Christ Church, incorporated 12 May 1894. Their third church is the one at Trenton in Henry County. This latter church, organized during the 1880s, became one of the first members of the Mennonite Brethren in Christ Conference, founded in 1883. Later another congregation was established in Council Bluffs and in the mid-20th century the Grace Missionary Church (UMC) was organized in Iowa City. During the Civil War Mennonite families from Virginia settled in Keokuk County, Iowa. When S. B. Wenger moved to the community in 1879 he hoped to establish a Mennonite church there, but not until 1898 was a congregation organized at that place. In 1953 this Mennonite (MC) church had a membership of 92. In 1892 and after, Amish Mennonite families from Illinois moved into Calhoun County, Iowa. Five years later their congregation, now known as the Manson Mennonite Church (MC), was organized. In 1953 it had 273 members. Dissatisfied Old Order Amish Mennonites of Johnson County established a settlement in Buchanan County during 1914. After that time others moved in from Kansas, Indiana, and Ohio, and in 1953 their total membership was 353. Other Old Order Amish organized a Beachy Amish church in Johnson County in 1946, now known as the Sharon-Bethel church. Others leaving the Amish in the 1940s and 1950s joined the Conservative Amish Upper Deer Creek Church, which led to its expansion into the second congregation, Fairview, the two having a combined membership in 1953 of of 470. Missionary activity of the Johnson County churches brought about the establishment of congregations in Iowa City and at Iowa Valley. The most recently established Mennonite community in Iowa was the one founded in the 1950s near Luton in the western part by the Evangelical Mennonite Brethren. A mission (MC) was started in Des Moines in 1956. The Mennonites in Iowa in the 1950s were mostly rural although a shift to small town business gained momentum among them beginning in the 1930s. The chief towns in which Mennonites lived, either as retired citizens or as businessmen, were South English, Wellman, Kalona, Iowa City, Wayland, Donnellson, Pulaski, and Manson. Many Mennonites were engaged in specialized agriculture, especially in the turkey industry. The Maple Crest turkey industry, which began in the Johnson County Mennonite community, was nationally known. The only Mennonite church institution in the state is the Iowa Mennonite School, northeast of Kalona, founded by the local churches (Mennonite Church and Conservative Amish Mennonite) in 1945. In 1878 Samuel D. Guengerich of Johnson County launched Der Christliche Jugendfreund. In 1912 S. D. Guengerich and four other Amish leaders, three of whom lived in Iowa, organized the Amish Mennonite Publishing Association, which has been an important influence in the life of the Amish. The General Conference Mennonite Church had its origin in a conference meeting in the West Point Mennonite Church in May 1860. Among the prominent Mennonite leaders in Iowa have been Christian Schowalter (1828-1907, GCM), Benjamin Eicher (1832-1893, GCM) Joseph Goldsmith (1796-1876, MC), Sebastian Gerig (1839-1924, MC), Jacob Swartzendruber (1800-1868, OOA), Jacob F. Swartzendruber (1851-1924, OOA), and Samuel D. Guengerich (1836-1929, CAM). Iowa had 37 Mennonite and Brethren in Christ congregations in 1987, with a combined membership of approximately 4,500, representing Mennonite Church, General Conference Mennonite Church, Conservative Mennonites, and Beachy Amish Mennonites. Amish and other churches not affiliated with any conference add another 23 congregations. 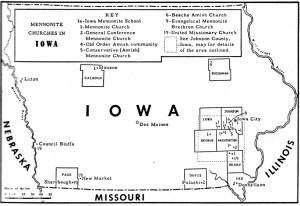 New areas where congregations were founded by the Mennonite Church (MC) since 1955 are in Des Moines (1956), Fort Dodge (1956), Davenport Spanish (1963), Muscatine Spanish (1969), Ames (1977), and Cedar Falls (1981). Ames and Cedar Falls are also affiliated with the General Conference Mennonite Church. Kalona Mennonite Church began in 1956 as a second place of worship for the East Union Church and was organized as a separate congregation in 1958. What had begun at Eureka as an outreach of Wayland area churches became the Washington Mennonite congregation in 1958. New settlements were established by the Old Order Amish in Van Buren County near Milton in 1969; in Davis County at Bloomfield in 1971; and in Mitchell County at McIntire in 1975. Beachy Amish Mennonites established a congregation at Leon in Decatur County in 1958. Since 1960 the Amish have established their own elementary schools in all of their settlements. In 1978 interested Conservative Mennonites started the Pathway Christian School near Kalona. Using an A.C.E. (individualized instruction) curriculum, the 1987 enrollment in grades kindergarten through twelve was 53. In 1985 Brethren in Christ congregations were located at Dallas Center and Des Moines (combined membership, 39). ARDA: The Association of Religion Data Archives. "State Membership Report: Iowa, Denominational Groups, 2000." http://www.thearda.com/mapsReports/reports/state/19_2000.asp (accessed 21 March 2009). Bachman, Emma K. "From the Krehbiel Family Album." Mennonite Life 10 (July 1955): 135. Beachy, Jonas. Districts of Johnson and Washington Counties, Iowa.1986. Documents Relating to Bishop Jacob Schwarzendruber (1800-1868). Reprinted from Mennonite Quarterly Review 20 (July 1946). Gingerich, Melvin. "A Century in Iowa." Mennonite Life 2 (January 1947): 24. Gingerich, Melvin. The Mennonites in Iowa : marking the one hundredth anniversary of the coming of the Mennonites to Iowa. Iowa City, IA : The State Historical Society of Iowa, 1939. Haus und Handbuch für die Familie David Ruth, zu Eichstock, 1852. at Mennonite Library and Archives, Bethel College (North Newton, Kansas, USA). Hege, Christian and Christian Neff. Mennonitisches Lexikon, 4 vols. Frankfurt & Weierhof: Hege; Karlsruhe: Schneider, 1913-1967: v. II, 436-438. Horsch, James E., ed. Mennonite Yearbook and Directory. Scottdale: Mennonite Publishing House 1988-89: 24. 1986 Annual Reports, Iowa-Nebraska Conference (MC). Luthy, David. The Amish in America: Settlements that Failed, 1840-1960. Aylmer, ON: Pathway Publishers, 1986: 8. Neufeld, Vernon. "Mennonites Settle in Lee County." Mennonite Life 8 (October 1953): 170. Swartzendruber, E. G. Amish and Mennonite Church Centennial near Wellman and Kalona, Iowa. 2nd ed. Wellman, IA, 1953. Wikipedia. "Iowa." http://en.wikipedia.org/wiki/Iowa (accessed 21 March 2009). Gingerich, Melvin and Grace Tiessen. "Iowa (USA)." Global Anabaptist Mennonite Encyclopedia Online. March 2009. Web. 21 Apr 2019. http://gameo.org/index.php?title=Iowa_(USA)&oldid=145490. Gingerich, Melvin and Grace Tiessen. (March 2009). Iowa (USA). Global Anabaptist Mennonite Encyclopedia Online. Retrieved 21 April 2019, from http://gameo.org/index.php?title=Iowa_(USA)&oldid=145490. Adapted by permission of Herald Press, Harrisonburg, Virginia, from Mennonite Encyclopedia, Vol. 3, pp. 49-51; vol. 5, pp. 451-452. All rights reserved.